If space is short in your kitchen consider buying a kitchen island with seating. I’m always advising people to consider buying items in the home that do double duty. A kitchen island with seating is a perfect example of this. Not only will they provide extra counter-top space but you can use the seating area to provide a breakfast bar or even a place to sit down while you prepare your food. 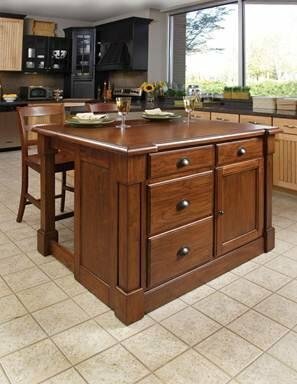 Here are my top ten kitchen island with seating picks. Some styles of kitchen islands incorporate storage in the form of cupboards and wine racks providing useful extra storage if space is a bit tight in your kitchen. 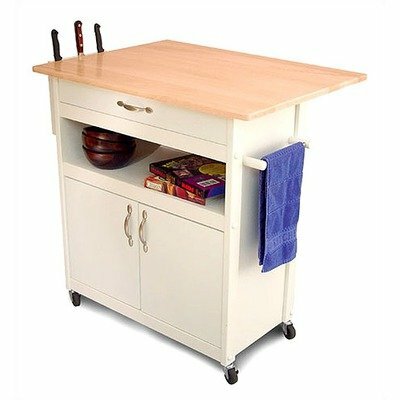 This stylish mobile kitchen island is made from durable sustainable hardwood, and incorporates 2 utility drawers, adjustable shelving, knife block and towel rack. 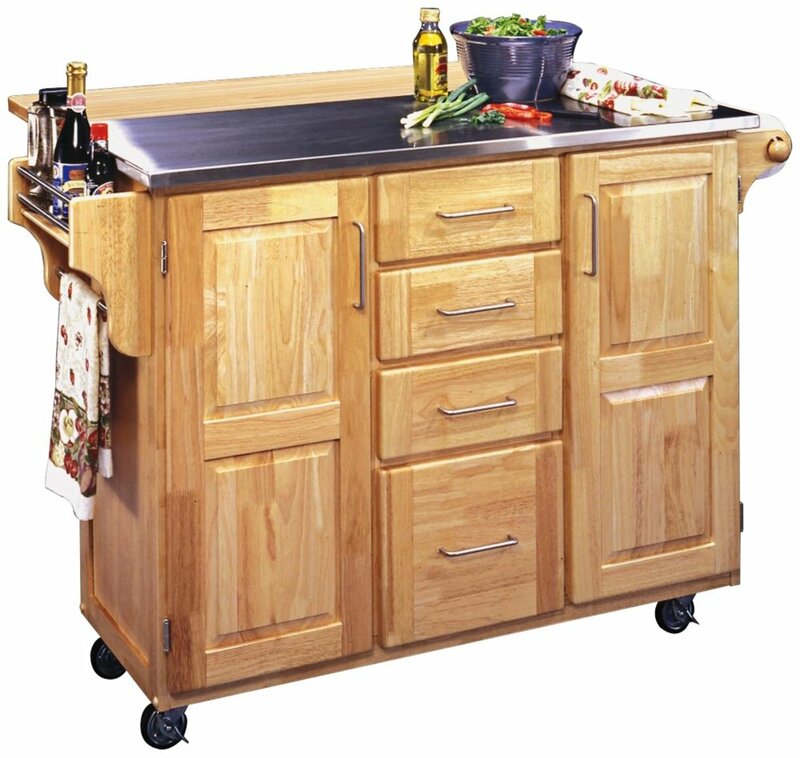 The island can be moved around on heavy duty locking casters. I just love the plain simple and functional looks of this kitchen island. This is going to look fantastic in any style of kitchen. This kitchen island will provide plenty of counter space and a breakfast bar area. Made from a sustainable and durable wood called paprawood (or rubber wood) this is built to last. Requires some home self assembly. 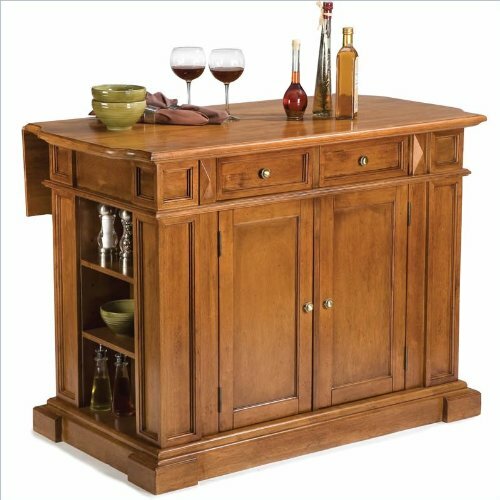 This is a substantial kitchen island great if you have plenty of space in your kitchen. 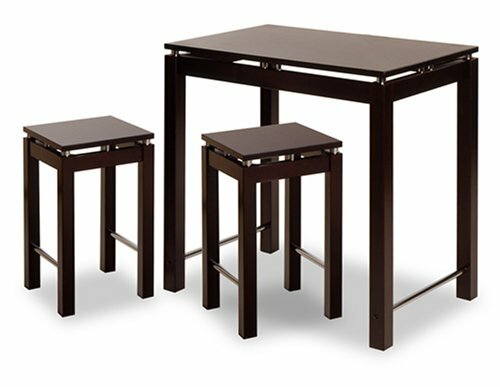 The breakfast bar has a clever extending mechanism so you have the option of a extending or reducing the size of the breakfast bar depending on your needs. The island has plenty of drawer and cupboard space and provides extra work top space for your kitchen. The island is finished in a Cherry wood veneer. Comes with two solid wood bar stools. 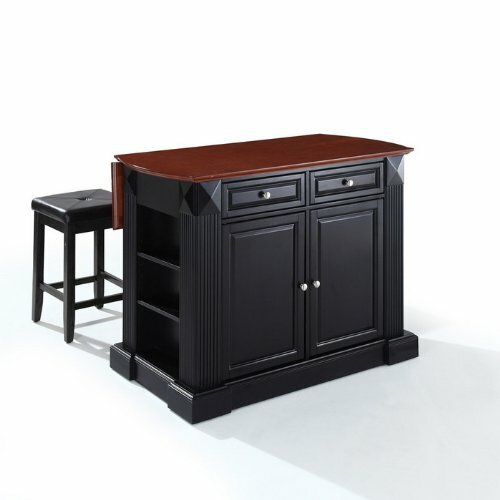 This Drop Leaf Breakfast Bar Top Kitchen Island in Black Finish with Black Upholstered Square Seat Stools is constructed of a mixture of solid hardwood and wood veneers. This island will provides ample counter top space as well as a place to sit and eat your breakfast. The island also has plenty of storage including cupboards with adjustable shelves and shelving for open storage. This island is certainly from the luxury end of the kitchen islands available to buy. Some design features include a solid wood counter top with a black granite insert, this island also incorporates plenty of cupboard storage space. The breakfast bar is designed to fold down when not required and the island comes with two bar style stools. The finish is a white distressed antiqued paint effect. This kitchen island incorporates a breakfast bar. 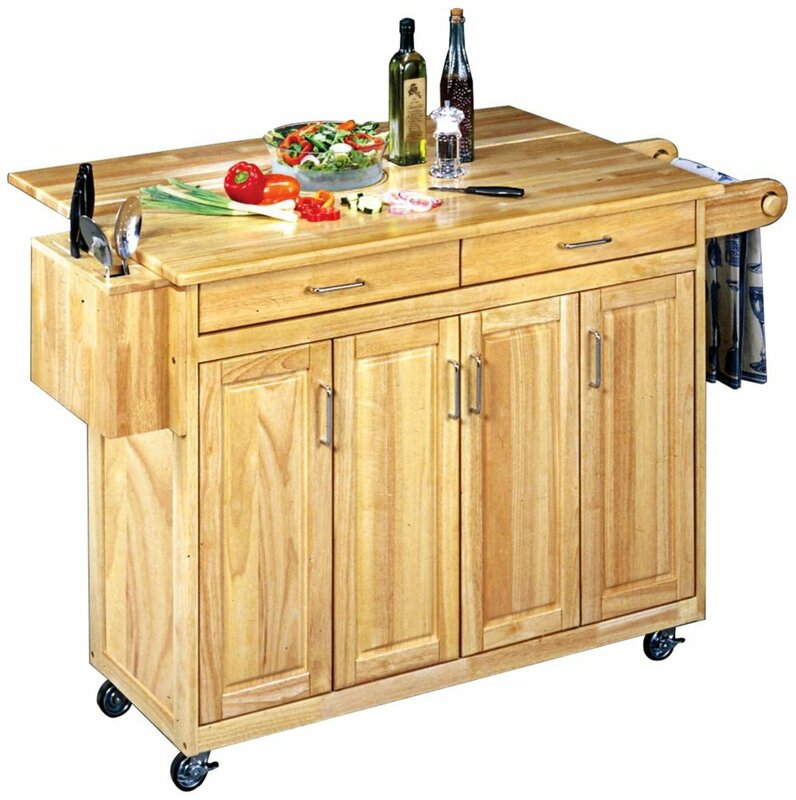 For convenience the island is mobile as it has 4 lockable casters. The work surface is finished in practical stainless steel. The breakfast bar is made from wood and has a drop down leaf to give extra space when the table is not being used. Also included is a towel bar, condiment caddy and a paper towel holder. This is certainly a great looking kitchen island with seating. It is practical also as it has plenty of work surface and has a large breakfast bar. Inside the unit is plenty of space for storage, as it has open shelving on the sides, two drawers together with cupboards with adjustable shelving. 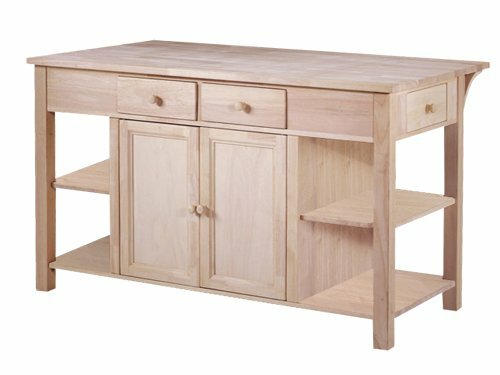 This kitchen island is constructed from sustainable hardwood. Self assembly is required. 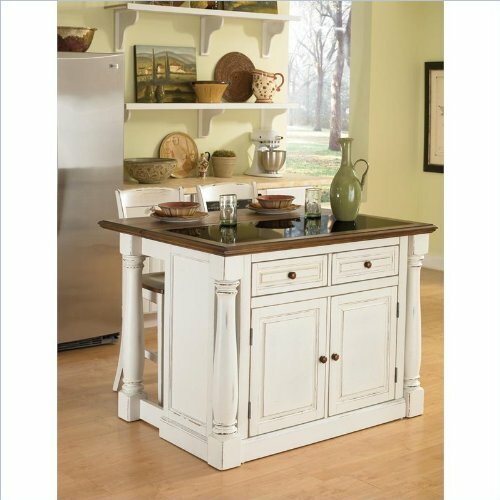 This is a lovely stylish kitchen island, which has a lovely white distressed finish. It is made from an Asian hardwood. This island also comes with two bar stools so you can eat your breakfast in comfort. The breakfast bar can be lowered after use to free up space when not required. In the island is plenty of storage space consisting of adjustable shelving and storage drawers. Easy home assembly is required. If space is small in your kitchen this may be the kitchen island for you. I has green credentials as it is manufactured by Catskill Craftsmen using sustainable woods. Cleverly the waste materials from the manufacturing processes are turned into fuel pellets and used to heat homes. 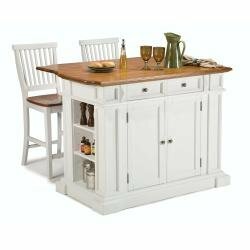 Features of this kitchen island are a drop leaf breakfast bar area, locking caster wheels. knife rack, paper towel bar and integral storage. This is by far the smallest kitchen island with seating I could find on the market. It has no frills just a work area and seating area combined, would be suitable for a tiny kitchen space. When not being used as a place to eat your meals the stools store neatly under the island freeing up space, enabling you to use the top as an extra work top. The finish is a lovely dark brown color called Dark Espresso. Easy home assembly required.